I’m kind of strange in that one of my favorite types of gifts to receive is food-related or kitchen tools. Honestly, nothing is more exciting to me than either of those things. I could get lost in William’s Sonoma or Sur La Table. So I was excited when I first stumbled upon the Mary’s Secret Ingredients subscription box. I was using the Freebie app, which allows Chicago’s heavy social media users access to delicious food, events and more in exchange for a social shout out. Freebie was offering users this box for just the cost of shipping, so I decided to give it a try. Instead of getting a lot of random cooking ingredients that might be hard to actually imagine using, this box was a useful combination of ingredients and kitchen tools. Ardent Mills: Ultragrain All-Purpose Flower (Estimated Value $5) – This flour is touted as being healthier than regular white flower and can be used interchangeably in recipes without messing up your baking. Before I fully understood it, I’ve messed up recipes using whole wheat flower. This is the perfect pantry staple for people who want to be just a little healthier and don’t want to think too hard about switching up their recipes. Coastal Goods: Sarah’s Sea Salt – Tuscan Salt (Value $6.25) – I absolutely love spices and seasonings, and this one is no exception. Rosemary is one of my favorite ways to season meat, and it’s one of the main ingredients in this mix. I’ve seen smaller packages of seasoning that retail for a higher price than this, so I’d consider it to be a value. Jenkin’s Jellies: Hell Fire Pepper Jelly & Guava Brava Pepper Jelly (Value $14) – I’m actually quite intrigued by this spicy jelly combo. The Jenkin’s Jellies website suggests using it paired with cheese and crackers or as a topping… yum! I’ve got some experimenting to do. POURfect Ultimate Measuring Spoons with Leveler Tool ($13.99) – This is actually one of the main kitchen tools I’ve been missing, which has resulted in many hasty and incorrect measurements when baking. Now I have no excuse! What I love about this particular set is that it’s so exact, even in super small measurements. The leveler tool helps make sure you don’t use even one grain too many. Total Cost: $25. Used a 25% off discount and paid $20. Use code “LOVEBOX” before 12/4/15 for 25% off a box! I think this subscription box is enough of a value to get it even a third time! Especially when you consider the fact that you aren’t even paying extra for curation. So far I’ve been very pleasantly surprised and each month is something new to look forward to. 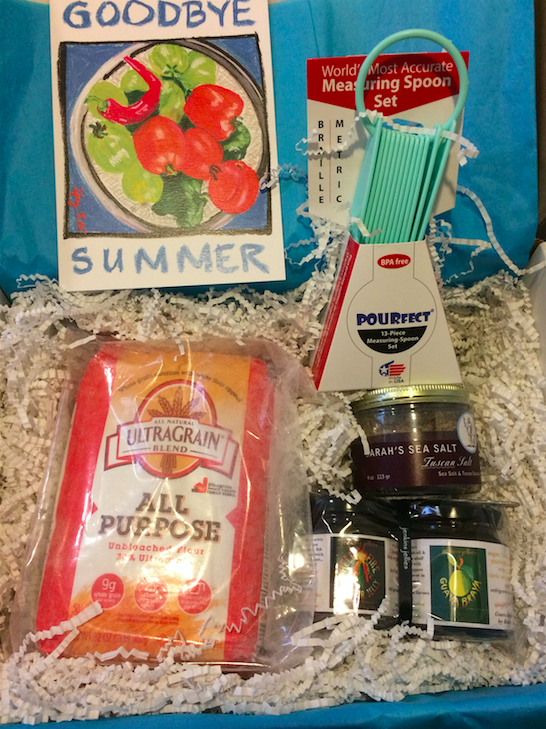 Would you give Mary’s Secret Ingredients subscription box a try? What subscription boxes have you tried? Let us know in the comments!